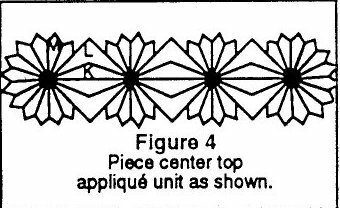 This pattern is an old favorite that's been around for many years. It can look striking and bold or soft and flowing depending on the colors you pick. Pick any colors you want... Let your imagination be your guide. 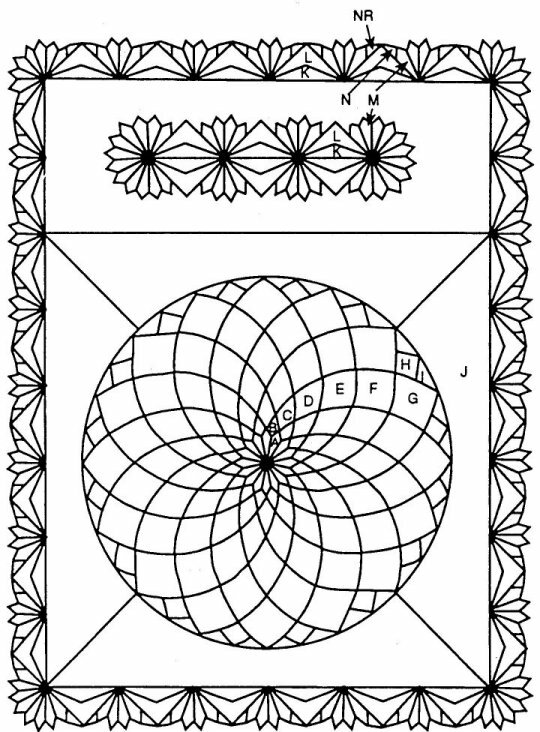 * Batting - 80" x 102"
Prepare templates using pattern pieces given. 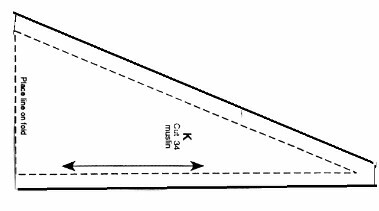 Notice that many of the pieces are to be CUT ON THE FOLD. If it would be easier for you to cut in layers then use the half pattern given to make a template for the whole piece. Cut as directed on each piece. Begin by piecing the center A section, being careful in the center where all the points meet. Always press with all seams going the same direction. 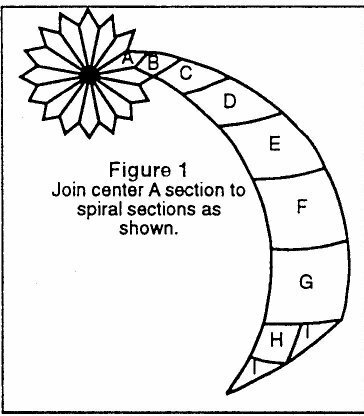 Place a spiral section beginning with peice B. Sew B to C to D to E to F to G. Sew I to H to I and sew to G on the pieced unit inh a counter clockwise direction. Sew 16 spiral units to complete the center dahlia design. 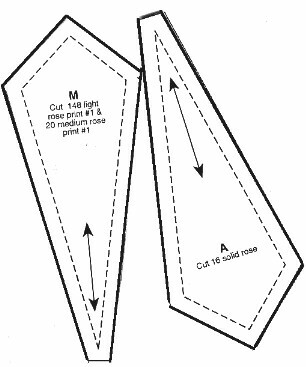 Referring to the next picture, (figure 2), make a J pattern from a large piece of paper. Sew the J pieces to the center pieced unit and join J to J at the corners. 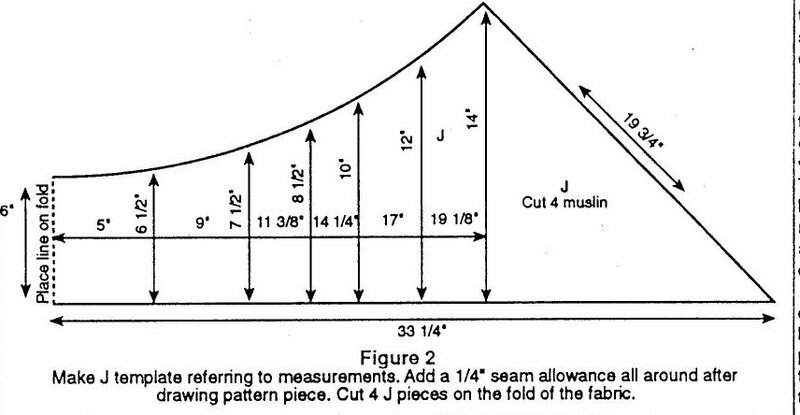 Cut the top panel piece for the pillow tuck from the muslim using figure 3 as the pattern. 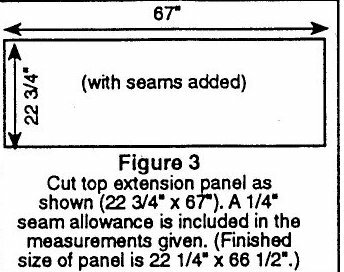 Cut 22 3/4" x 67" (seam allowance is included in this measurement). 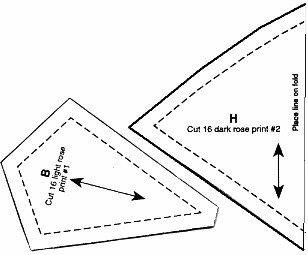 Fold the panel piece to find the center and crease. Piece the center applique' section as follows: Sew L to K. Repeat and join on K side. Sew M to each L side., repeat twice and join the 3 units at M ends. 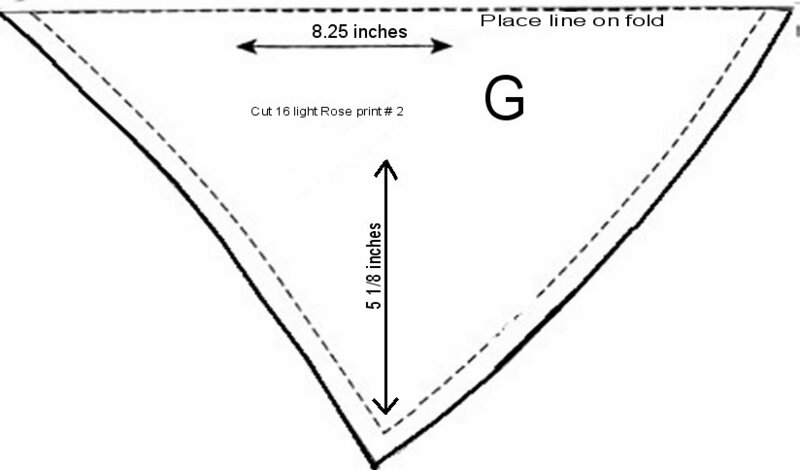 Sew 8 M units together to make end flowers and sew one unit to each end of the pieced unit. Turn under edges 1/4" all around and center on panel using fold lines as a guide for placement. 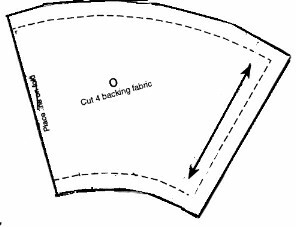 Applique' in place with a slipstitch or blind applique' stitch. Sew panel to previously completed larger flower panel to complete inner portion of quilt. 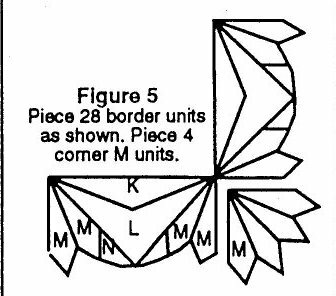 To make borders, piece 28 K-L-M-N units together using Figure 5 as a guide. Joint two strips with 8 border units for sides and two strips with 6 border units for top and bottom. Add to quilt and set in corner M units to complete the top. Press. Finish quilt by completing layers with backing and batting, marking quilt design and quilting. A quilt of this complexity usually works best if you can stretch it on a quilt frame for the actual quilting process. 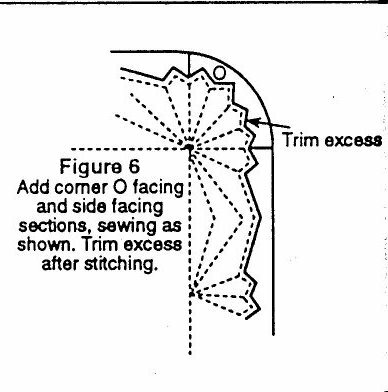 To finish edges, cut four O pieces as shown in figure 6 from muslin for the corners. Cut two strips 3" x 68" for sides. There will be a little extra to trim. Pin the O pieces and the strips to the quilt top right sides together, and sew around the M shapes all around the quilt. Trim off the excess and turn right side out. Press, making the muslin facing to to the back, it should not show on the quilt top. Fold under the edges where the O and the muslin strip meet at the back corners and slipstitch the seam to the quilt's backing to finish. These are the actual pattern pieces. They should be the correct size. They will be easier to use if you paste them to stiff cardboard to use as a cutting template after you print them out.